In April 2012 Trawangan Dive signed up to participate in Project Aware's 100% AWARE month. 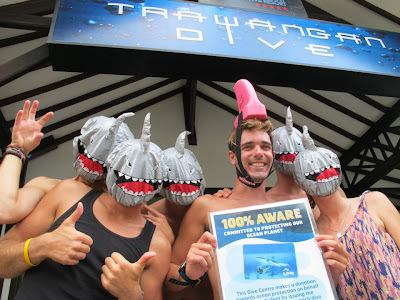 During April’s Big Shark Shout Out, we joined with other divers worldwide and called for greater protection from overexploitation: overfishing, finning, and bycatch. 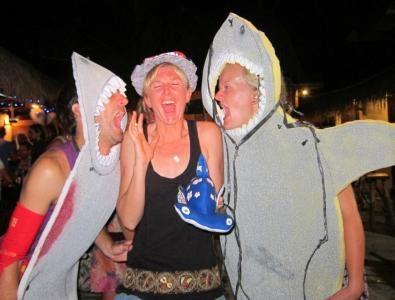 Throughout the whole month of April we set up lots of different events in order to promote and increase awareness of Project AWARE's big shark shout out! During April we thought it would be a good idea to go viral and make a video that would get peoples attention and help raise awareness for Sharks. At the time we had two Divemaster Trainee's Nick and Helen who were both hearing impaired so we thought we'd get the message across in Sign Language! They taught all the Instructors and Divemasters various amounts of sign language, some of which couldn't have been included in the video! 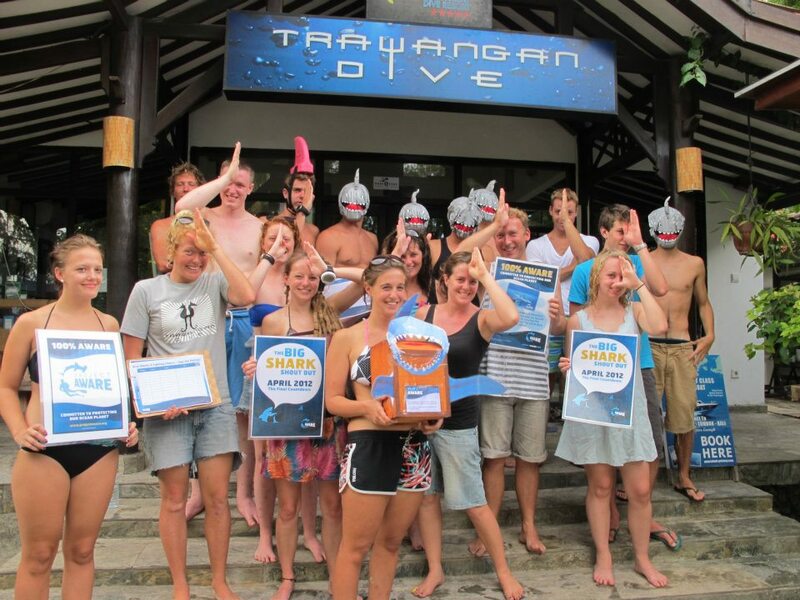 A big thanks to all the staff at Trawangan Dive who took part in the video, we all had great fun making it! Please like and share our video to help get our message out there! We were very pleased during the month of April to receive a visit from Project Aware's very own Finely the shark. 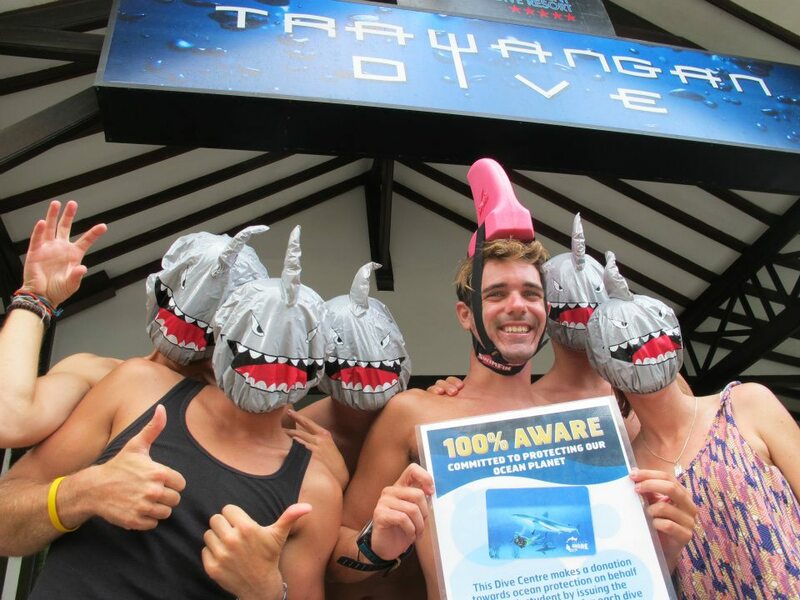 Finley is touring the world to rally support for shark conservation and encouraging people from around the world to sign the Shark petition! 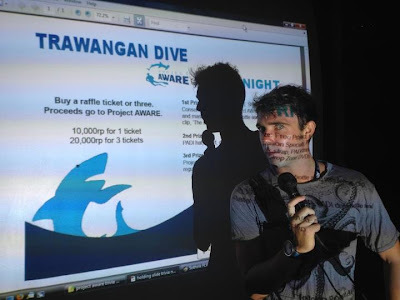 For you to save the Sharks please sign Projects Aware's Shark Petition by visiting Trawangan Dive's Facebook Page. 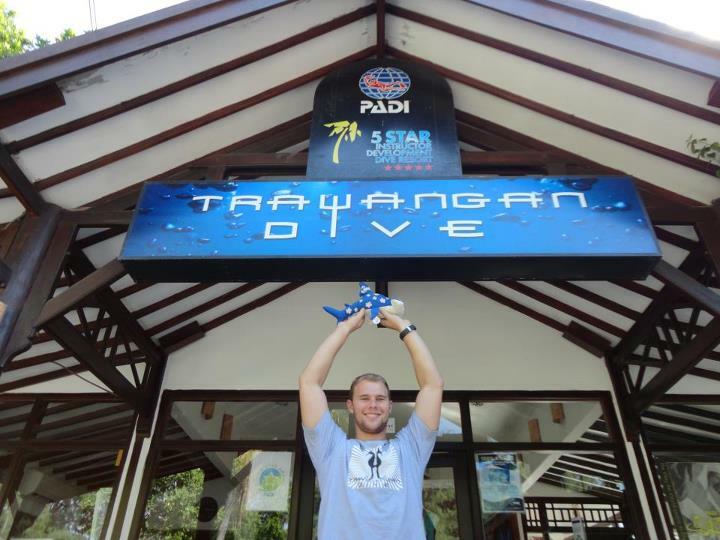 During Finley's visit, we got him involved in all the action from diving against debris and joining us on our divemasters snorkel tests! Finley joins in the fun of Nick and Helen's Divemaster Snorkel Test! During Trawangan Dive's weekly Quiz night we decided during the month of April to base the Quiz around Project Aware. Thanks to our Instructors James Wells and Jo Hurford, for organising and hosting the Quiz. Included in the quiz was a sock puppet round were by Jo and James had previously filmed themselves acting various films for our amusement! It was then audience's turn to guess the film it was from, the films included Jaws to Finding Nemo! Other rounds included Fish charades (James making a fool out of himself), General ocean facts, Project Aware facts and other Conservation facts. 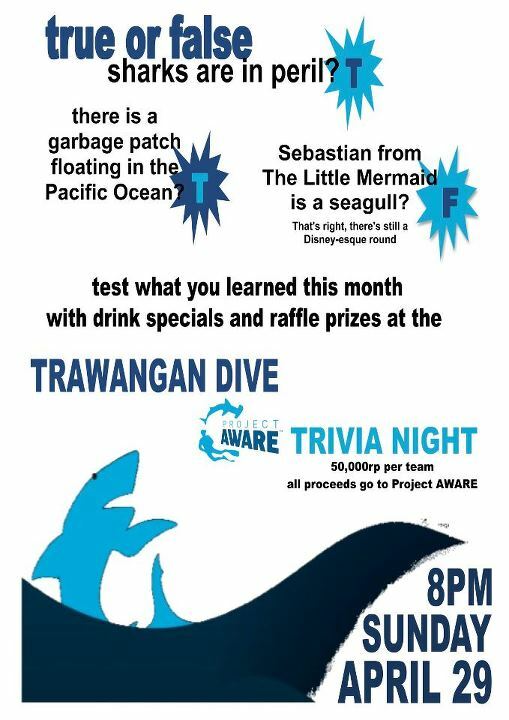 The quiz was a great turn out, thanks to all who came and joined in the fun and made a donation towards Project Aware.